So... I have a mallard near my home, it doesn't run from me anymore, I think i've been around him for around 60 days now and the winter started to kick in, the problem is that he was on the water and the water tile froze with him on it, so he got bugged and couldn't move anymore. This is something strange for me, I doubt a bird would get caught by the ice like that and it could be somewhat exploited, I mean, I could simply kill it with one blunt hit since he was stuck. Edit: Okay, he tried to "land" on the ice and is unable, that's what is causing the bug. I bet swans also suffer from this bug. 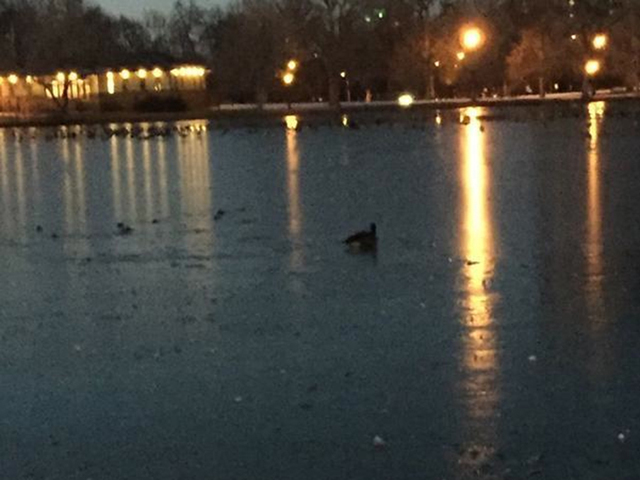 Though rare, or at least rare that it's caught on camera, water birds do get stuck/frozen into ice some times. I've seen it happen to geese. Oh! I thought that was something extremely rare... But it's something I never knew for sure that could happen. I have hard time following this report, or trying to pinpoint the bug suspicion. Could you clarify a bit... so I get there was a mallard that didn't move at all, right? But then it did move eventually, or what happened when he tried to land on the ice? If the weird condition is still on there, save the game and send it over to me. However, animals staying at the same area for a long time is not a bug. But if the bird was able to fly (not injured), it really shouldn't sit still for days on end. Sorry for not making it clear, the Mallard was on the fly sprite above the ice, but he didn't move for about 3 days ingame, I got puzzled because of that and so I moved and broke the ice tile below him, once I broke it he started moving again (fleeing from me) a day or so later, I saw him again frozen at the middle of the river, for a day he stayed there and then I broke the ice below him once again. What I said about he "trying to land" would be the AI trying to land and entering in a loop of sorts, that's what I think that happened since I broke the ice. Unfortunately, I don't think I have a save with the problem happening, but, if you want I can give you the save from the char with who it happened, maybe it will happen again in the near future, that save just entered winter. Ah, thanks for the follow-up, now I got it and this all sounds clearly bugged. I'll try to reproduce this on my own, no need for the save of your character specifically. I can't think of anything in the code actually preventing birds from landing on the ice as well, so at this point I'm clueless about what might have caused this. We'll see. Reproduced, found, and fixed. Aquatic birds may (rarely) seem to get stuck flying still above the frozen waters. This is due to failure in their terrain exploration routines which do not find new meaningful locations to fly to and check if the waters at their habitat get completely frozen. So they are flying still because of zero/null/undefined destination.